Stewart Lines is halfway through his maiden Dunlop MSA British Touring Car Championship season and the Midlander is looking onwards and upwards for the rest of the campaign. 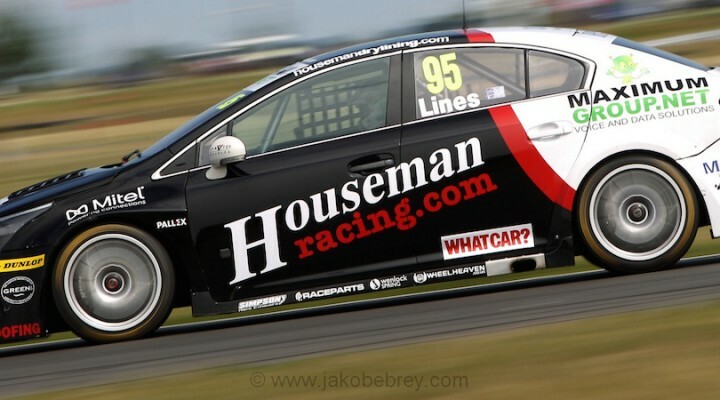 The Houseman Racing driver narrowly missed out on the points in the first three events of the season with a 17th at Brands Hatch, 17th at Donington Park and a 16th at Thruxton. Results at the next two events were not so easy to come by and although Lines was pleased with his overall pace he believes now is the time to start making progress up the order. Lines’ formative career came in the Mini Challenge, Clio Cup and more recently the Volkswagen Cup and VAG Trophy, where he scored a number of race wins. Accolades in the 2013 and 2014 seasons included finishing third in the VW Cup, second in the VAG Trophy and third in the Golf GTI challenge, scoring a total of 25 podiums along the way. Some of those pre-BTCC success days came at Snetterton, a circuit Lines is very familiar with. “I’m comfortable on the track because I’ve raced here quite a bit, but now we’re trying to improve the car and find some time,” he commented at the recent test at the Norfolk track. “We made some changes to the car and it’d be good if we could find a second or so. “The main objective was to get more seat time in the car. The more laps I can do the more comfortable I feel. The Toyota Avensis man is an impressive second in the Jack Sears Trophy, but he’s hoping that the next event will provide a springboard towards scoring overall points as his confidence continues to grow in Britain’s toughest championship. “The only track in the latter half of the season that I’m not that familiar with is Knockhill, so knowledge of the other tracks along with my growing confidence in the car should help for the remainder of the year,” he concluded.